Monsoon has already set in and the season's first festival - rath (or 'roth's as it's pronounced in Bengali) is just around the corner. A festival rooted in ancient Vaishanvism, Kolkata's rath yatra may not be as old as Puri's, but is definitely just as big. A noobie or an old hand, here are five things you must absolutely know about Kolkata's grand eight-day festival of rath. An ancient Vaishnava festival, rath was popular only in pockets of Bengal, until ISKCON replicated the grand tradition of Puri and started the festival in Kolkata in 1972. Celebrated each year without fail, thousands of people file the streets of Kolkata to throng around the chariot and have a pull at it. Rath has in fact gone on to become an integral part of our childhood as we joined into the festivities with fervour and enthusiam. The biggest attraction of Kolkata's rath yatra is of course ISKCON's rath and its procession. 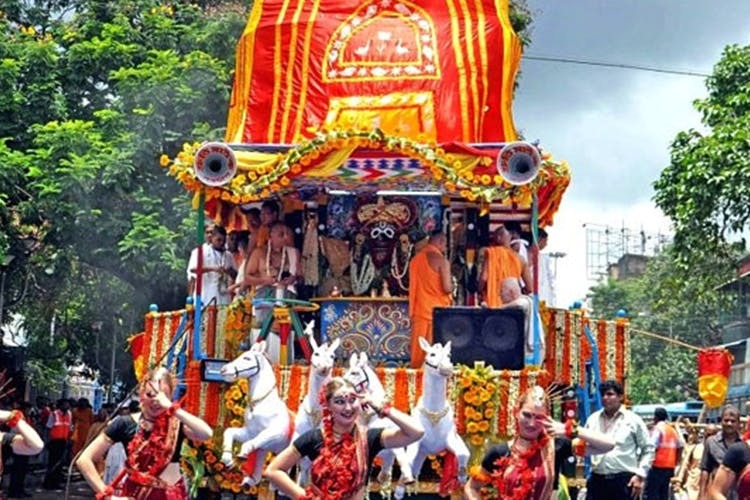 A prototype of Puri's chariot and idol, ISKCON's rath leaves the temple premises at Albert Road to wind around the city until it reaches the Brigade Parade Ground, where it stands for the next seven days. A severly patriarchal institution, we suggest you censure their ideology and just participate in the colourful cultural programme of song, dance and community bonding. The best part of rath is getting your own little chariot, decking it out and placing the clay idols in the seperate compartments. And then pulling it around the neighbourhood. We spent many blissful childhood rath days doing that. And even today, you will see kids doing that in the nooks and little lanes of Kolkata's paaras (hoods). Head out to any of the big markets like Jaggu bazar, Manicktala bazar, Sealdah, Gariahat, Kalighat, Lake Market, Lebutala and Rashmoni bazar to pick up your own colourful 'roth' and idols of different sizes. The fun of course lies in helping the little ones decorate it with nifty craft works! The excitement lies not simply in pulling the little chariots around, but also in visiting the fun melas (fairs) and bingeing on staples like papad and jalebi or hitting up ISKON's cafe Govinda's for special rath delicacies. The biggest fair sets up around the ISKCON chariots in the Brigade Parade Grounds. Like every year, this year too you can catch the Gundica dance festival in the evening and binge at the food stalls (check here). You must alo check out the other melas at Moulali and Amherst Street. Did you know that Bengal had several other old rath yatra traditions, besides that of ISKCON'S? The rath yatra of Mahesh in Serampore that started in the 14th century is said to be the oldest one after Puri's. You can also take a short trip around Bengal and check out the unique tarditions of the rath yatras of Guptipara, Rajbalhat, Mahishadal and Mayapur. Interestingly, there's also another Jagganath temple in Kolkata in Khidderpore that takes its chariot around the city on rath.